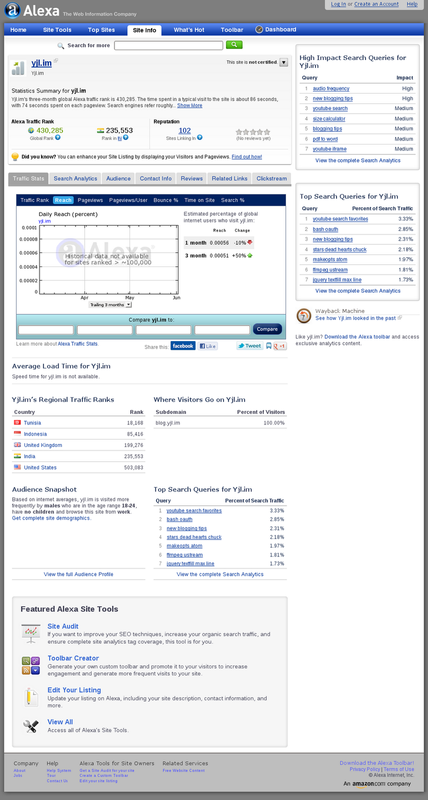 I stumbled on Alexa.com for stats about my domain yjl.im. Alexa.com claims they track 30 millions in their front page, then it means my website is at 99th percentile (430,285th), which only means there are a lot of crappy or pretty idling websites around. I truly doubt my website can rank this high, even Alexa.com statistics is not comprehensive, it can't show the whole picture. My site has 102 links-in, but more than half of them are scrappers to Alexa or those domain listing directory I hate. This only proves that most of websites are garbage once again. I really wish people would visit my sites from home and not mostly via search engine. I don't want my site to be technical mainly, but that's what it is, at least for now. Someday, my site would be read by everyone, that's the goal. 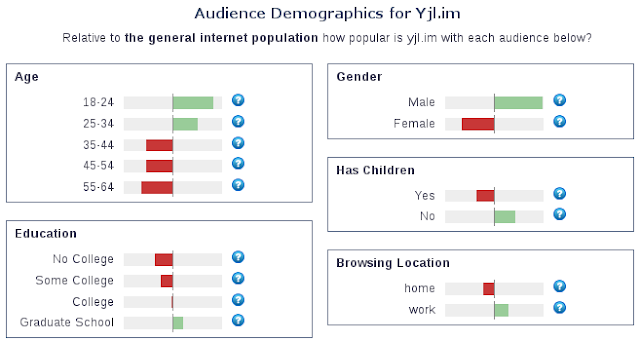 Relative to the overall population of internet users, Yjl.im's users are disproportionately male, and they are disproportionately childless people under the age of 35 who browse from work and have postgraduate educations. It seems young, male, and highly educated adults are my primary readers. No children do not mean much to me, I am also curious about the marital status, but it's not included. It it was no children, single, and never married, would that mean nerds? Visitors from India are top 1 readers, then from United States. Interestingly, Tunisia is on the top 5, not sure why so. As I said, Alexa doesn't show the full picture, it's not accurate. If I am correct, it relies on its toolbar web browser plugin. 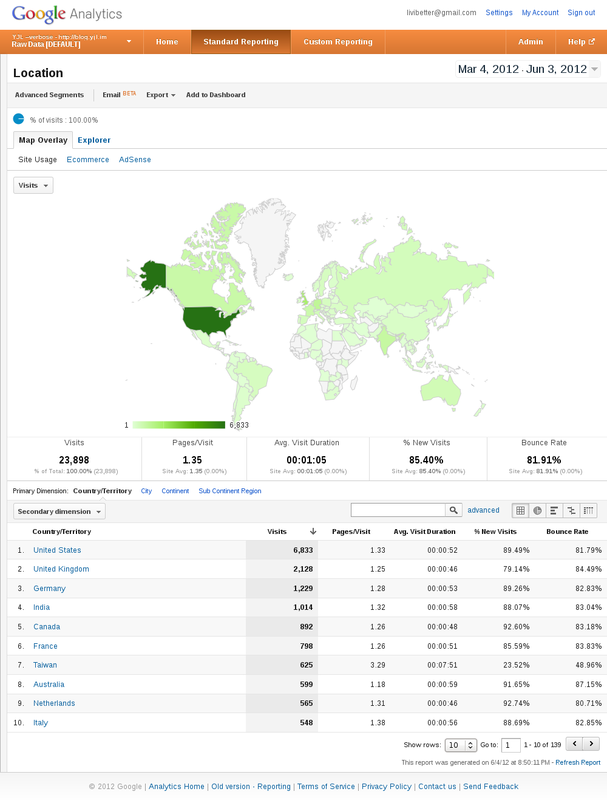 According to Google Analytics, within similar 3-month range, United State is the top source, India only ranks 4th and Tunisia isn't in top 10. Too bad, demographics in Google Analytics, only location is helpful. As you can see, that's a huge difference, Alexa is never close to reality. Unfortunately, some still refer to its statistics. Its data is gathered by limited method. Even worse, it encourages you to put some code to your website in order to get better ranking, the data would be unfairly distorted. Well, the fact is it is not, I have never read the exactly same statistics (will explain why not the same soon) in FeedBurner, clearly the poster, Jonathan Simon, Webmaster Trends Analyst, has no idea what information their productsSubscriber stats and FeedBurner Subscribers tabhave provided and are based. At least, not familiar with altogether. 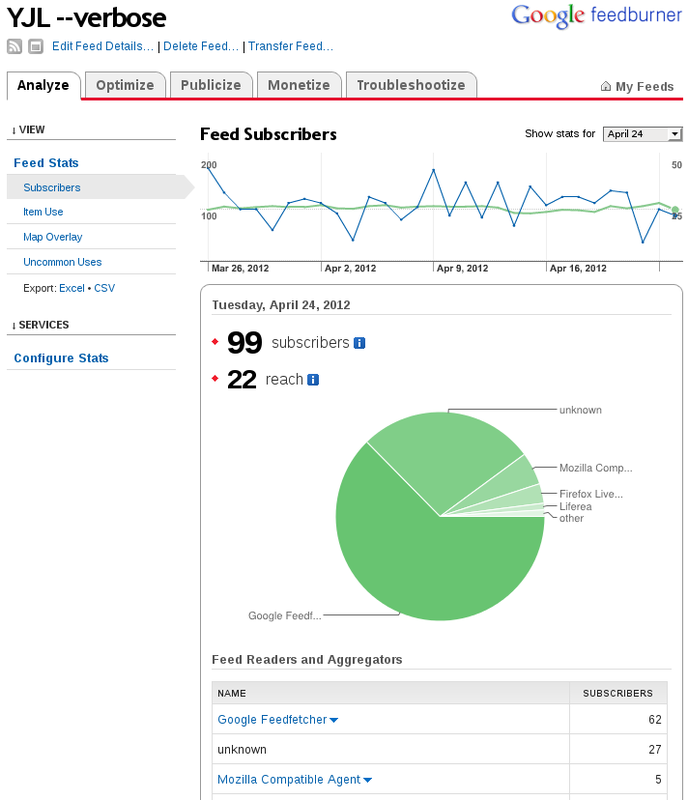 Feedfetcher is how Google grabs RSS or Atom feeds when users subscribe to them in Google Reader or iGoogle. Subscriber counts include Google Reader and the iGoogle. Feedfetcher collects and periodically refreshes these user-initiated feeds, but does not index them in Blog Search or Google's other search services. At first glance, it seems to say that it is same data as the one in Subscriber stats, but it is not, because that's not what you see. 62 != 21+3. Secondly, again, it's a summation, I would like to have more detail. As you can see in the screenshot, it's the old FeedBurner interface, I should've switched to new interface and see if the information is there. Wait, where is the link to switch interface version? It'd gone and I didn't notice until now. They probably had dropped the development some time ago and didn't even bother to post an announcement on FeedBurner's blog. Oh, yea, FeedBurner does have a blog, last post was published in October, 2010, you figure out right? Why 62 != 21 + 3? First of all, you need to know where are 21 and 3 from. 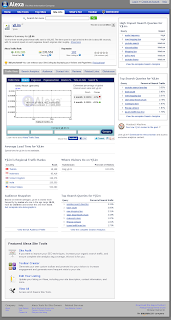 They are statistics provided by Google Feedfetcher bot in User Agent. If you want to get the number for your Blogger blog, you need to redirect feed to a piece of code to intercept the user agent, then redirect it (again) to the real feed, for instance /feeds/posts/default?orderby=update, which I think actually is where FeedBurner gets your content. The bottom line is, if FeedBurner does not provide such detail information, you need to have a intermediate server for catching those information in order to get individual numbers instead of just a summation. Back to the question: Why do my blog has 62 subscribers in FeedBurner, when Webmaster Tools only reports 21 + 3. This is because I have other Blogger blogs' feeds redirected to the same FeedBurner feed after I imported them into this blog. You can't distinguish the subscribers of different types of feed. You can't tell the subscribers apart if they are redirected from different sources. These two problems are fundamentally the same problem. FeedBurner sums up all subscriber counts by Feedfetcher, direct or redirected requests, with query string or without query string. As long as the redirected request made to same burned feed URL, they are all summed up as one number. For people who don't care, it's fine with you, you are satisfied with a big chuck of number. I care more about this kind of detail. I want to know what type of feed is being subscribed to and how many are from my old blogs' feeds. Once Webmaster Tools removes Subscriber stats, I can't know about it unless I make a simple script to record the number, it's not hard, but i do not want to do that. In fact, it only takes a few essential lines on Google App Engine. I wonder if there is a service which redirects to specific location and logs all HTTP headers for incoming requests. However, there is a way to get that Atom feed subscriber count which I have known a long time. I can search my blog in Google Reader, I get exactly 21 subscribers reported with my blog's feed. The problem is the searching function is somewhat slow and it's strange for me to do such task every week. To be fair, I am not surprised that poster doesn't know about this (I assume). Google has too many products already, it's hard to know every bit. If you test their employees, I am sure most of them can't even name a half of all products which are still in active development. In my case, you need to have such experience to know there is some details missing in FeedBurner's report. My conclusion is FeedBurner's Subscribers tab is not a replacement of Subscriber stats of Webmaster Tools. Unfortunately, I will live with it. Beside this issue, other removals, such as the generation of robots.txt, I have no problem of that, because I never used that. But some may find that handy, maybe they should open source'd that part into a standalone page. The last one is the Site Performance, I had used it once. I did want to see more from it, but I didn't know why there was no new data. Since Google Analytics has started to provide much more thorough data, down to each single page, which I have posted a few days ago. The title of this post doesn't mean anything for real. After udev is merged into the systemd tree you can still build it for usage outside of systemd systems, and we will support these builds officially. There is no need for me to concern about this, even though there were some stirring discussions over this. As long as I don't need to do extra configuration, then I am okay with it. The only drawback is the tarball will be bigger, don't know how big it would be, never use systemd before and I have no need. But if this will make the development easier, then I won't fuss over it. Examples of the law in action include Emacs, MATLAB, Mozilla and Opera. Every program in development at MIT expands until it can read mail. I found this is pretty amusing and somewhat true, but can MATLAB really read mail? Well, not directly, but you can sendmail for sure. I don't feel surprised when I saw Emacs in the list, though I don't really know if it can read mail or not. But once a while, I would stumble across stuff about the bloat of it. Two replies mentioned about GNOME5 and The Registry, quite sure it was meant to mock around Windows Registry. They are just for laughter, nothing really serious about it, but that doesn't mean they are not true. For Debian perhaps. However, I don't think this is true for GNOME. The future of GNOME is as a Linux based OS. It is harmful to pretend that you are writing the OS core to work on any number of different kernels, user space subsystem combinations, and core libraries. That said, there may be value in defining an application development platform or SDK that exposes higher level, more consistent, and coherent API. But that is a separate issue from how we write core GNOME components like the System Settings. It is free software and people are free to port GNOME to any other architecture or try to exchange kernels or whatever. But that is silly for us to worry about. Kernels just aren't that interesting. Linux isn't an OS. Now it is our job to try to build one - finally. Let's do it. I think the time has come for GNOME to embrace Linux a bit more boldly. Some people would have strong concern about it if this is real future of GNOME, especially people who use GNOME and already think GNOME is a colossal environment . Some may like the way it goes as becoming an OS, some may think it should not go that way. I like the way current Linux is. Yes, things are broken sometimes and you may need to put efforts in it if you really care about. Things are pretty complicated, but by having such goal, can you be sure you won't become another same Linux problem which you think Linux currently is having? You write code which you think they should be in OS core and bring up the issue across different layers of coding. If you look from another perspective, maybe that's because you shouldn't do things that requires such code? I think this somehow resonates with Zawinski's Law. You program expands to where it shouldn't be to. You definitely know you shouldn't, but you still go there anyway. I stopped using GNOME for at least three years, it had too many stuff I don't need and don't even know they were sitting in my system. I am not entirely sure what it really is, still a Desktop Environment? Same thought goes to KDE, I think KDE could be even bigger than GNOME. If GNOME evolves into an OS, I won't object it, but they can't be associated with the name "Linux" at all, even it includes Linux kernel within. It would be a new OS, no way you should call it Linux. It's not Linux, it would've gone from Linux road. Not even a Linux distribution, that GNOME will not be qualified for being titled with "Linux" or "Distribution." Desktop Environment (DE) is a loose term, you can define it with almost everything included or almost nothing, possibly boiling down to just a Window Manager (WM). In fact, you can even argue what should be in a WM. DE and WM would grow as other programs do, that's one of reason that I switched to DWM. Occasionally, people fork DWM and try to make more smaller version of it. I guess DWM is still too bloated for some. I think a couple of them can be un-merged, but just not all. As a Linux user, more or less, you need to compromise with a few packages or libraries. Linux is a diverse world, for just one task, you may be able to find ten libraries which can do the same job. When you find a program you like, it's possible that it uses a library you don't like. That's what Linux is and that's the way it has been, but some people don't like that and other don't want any changes to it. Since a few packages of GNOME on my system, I only concern if the number of depending packages will grow. And if GNOME become an OS, the situation may get complicated. Luckily, because of open source, if you don't like something, you are allowed to do something about it. Like MATE, a fork and a continuation of GNOME2. Only you need skills instead of a bitching mouth. Now, looking back at the time when Windows still a program you needed to type win to run it. It was a Desktop Environment, although Wikipedia uses different terms, such Graphical Environment or Operating Environment, even Operating System. But it was never a OS since it didn't handle low-level operations, not I know of. Until Windows 95, things were packed together, Windows became OS since then. It seems unavoidable that a Desktop Environment would evolve into a full OS, one way or another. It may not be the desires of developers but the users', anyhow, that's the direction, even you don't like it. Even so, you should be glad that it's a DE, not a program which reads mail. I just read this news about Twitter filed a lawsuit against five spammers. This post title explains what I had thought when I read the news, but according to The Guardian, Facebook and Google have already done the same thing with successes. I don't have an eye on Facebook, but I am pretty sure I didn't read any news about that from Google's blogs. Twitter posted about this on its blog, which I hadn't read for about two years. I like that, make a strong stand. Clearly showing their action towards spammers. Go Twitter! Sue the hell out of those disgusting people. Wasting their skill, coding programs that abuse other people and systems. The governments should try to build up criminal cases against those people! Darn it! I never understand companies like Google who doesn't try to show and to execute their principles of how they deal with spamming issue. I see nothing from Google, occasional blog posts do not really count. If you have read Google products' Google Groups, you can often see spams being dealt only after days, sometimes, they just flush out of first page of posts and everyone forgets about that. Indeed, there is a flag button. But that's your product's supporting forum. Okay, community support! Such a shame, using customers to help other customers. Some of those contributors don't even know what they are talking. And the blogs of theirs which still allow commenting, you often see well-designed spams slip in, passing Blogger's spam filter. Which is fine, the filter can't be 100%-effective, but you should have someone really read comments! Hire more people to run the forums and blogs, Google! No one would think you are a bad company when you take on spammers. You are terrible when you are quiet about it even you are doing something behind. Just yell it loudly, for garsh's sake! Sue them, then donate the money, that's how you boost your public image. You can read my thought about the "Reading list," it is useless to me and I really don't want it. I wonder if any Blogger blogger really read others' blogs in the dashboard. Isn't a feed reader more efficient? I think such feature is only for who doesn't know what "Feed" means and is for. Of course, you can show your readers what blogs you are following. But you can achieve by a Links gadget (or whatever that is called). And indeed, it shows your appreciation when you follow a blog. But I think linking to one specific post from a related post of yours is much more meaningful to the blog. Anyway, I just want an option to disable it or hide it, no data of that section is transmitted from Blogger. It's very interesting that you have a lot of options for individual Blogger blog, but not this dashboard. You only can turn on or off the important notification from Blogger. After replied to the first comment, I think I need to clarify more. First of all, I do not follow any blogs even you see "Blogger Buzz" in the screenshot above. Blogger thinks you need something to read, so they put their Buzz blog for you. 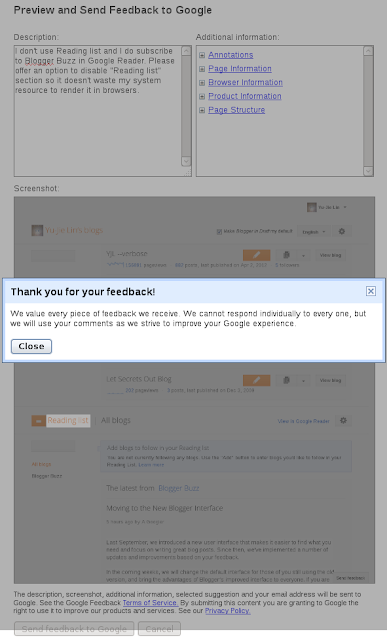 If you read the description of my feedback in the screenshot, you would know I have subscribed to Buzz already in Google Reader. Secondly, you may ask why don't you follow any blogs? I want to but I have to un-follow all because I don't want to have plenty of data I don't read in this dashboard. I read them in Google Reader. I un-followed all great blogs when the Draft was still in that old orangish background color interface, so that must be a year or two years ago. I wanted to let people know those blogs when they read the old Blogger profile, I really did. Now, I have connected my Blogger profile to Google+ Profile, so this part doesn't really matter anymore. So basically, this blog following feature is no more useful to me, since it can't automatically show the list in Google+ profile. You need to manually add links. Once again, manual mentioning or g+ a post or a blog is much more meaningful and they emphasize your appreciations greatly. But this is just me and my humble opinion. Earth Hour, a one-hour globally fanatic phenomenon? Once again, Earth Hour is coming up (or already arrived) at 8:30pm on March 31 this year. I was part of it (and Lights Out Day), a few years back, even posted a post for it. No doubt, it's intention is to bring up awareness in us. But over the years, I've realized and an hour of whole year really is not much. (1 hr) / (24 hr * 366) = 0.000113843352 = 0.011% for this year. It is not entire 0.011% of energy saved, because during the hour you still consume energy. Please don't try to multiply with world population, the globally saved energy is still at 0.011% roughly. I even tried to go dark in every program I ran, but it was not easy and I hadn't insisted that for a while. However, I still maintained to maximize the amount of programs which I could turn into a dark-themed ones. Every year, during this period, YouTube will re-install that switch. I know not all people like white background and why not just convert it into a new option? Google and those companies it owns always give us a sense of caring of everything, shaping themselves as a great companies which can't care much more about the world, people, policy, and so on. They are not the only companies or people. 0.011% of a year could be enough or not, that is really not a point here but who finally understands the Earth Hour is for. Unfortunately, it's like YouTube, it is just one-hour event for each region across the world. It is not really 60 hours (the logo seems to imply, I am not sure, only UTC-12UTC+14 timezones in this world, that's 27 timezones (per hour basis) basically) for each individual, only an hour for each individual or the whole world. Don't do it for occasions, do it for life. Don't just say it once a while, live it. If you don't know there is an option for dark theme on this blog for more than a year, it's located at top-left corner, try it out.